The tree was in decline and a lot of the branch tips had died back and the crown was full of deadwood, crown reduction should only really be done when a tree is in decline so this was a perfect example of a tree which needed reduction work. The idea is to reduce each branch back to live wood leaving a strong growth point to encourage vigour and new growth. 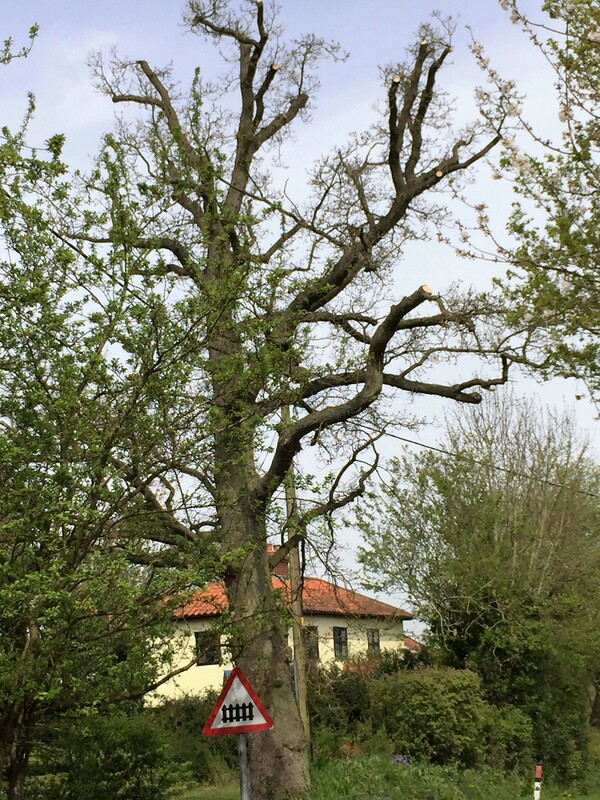 The tree was protected by a TPO (Tree Preservation Order) so we had to complete and send in a application form before any work could be started. This can take up to six weeks for the local council to process so needs to be sent in well in advance of anticipated works, the tree was also located over a road so we had to send in a Opening notice to notify the local highways of any traffic management which was being set up in conjunction with the tree work. Once the team arrived on site they did all the necessary checks surveying for wildlife and filling in a risk assessment before setting up traffic management using two way lights. There was limited access to the tree and as located on the edge of narrow road there wasn’t enough space to use a MEWP so the team carried out the reduction using rope access.